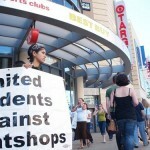 Register now for the 2010 United Students Against Sweatshops National winter conference in Knoxville, TN. It’ll be held February 19-22, 2010. This entry was posted in Uncategorized and tagged community organizing, empowerment, human rights, Knoxville, labor rights, TN, USAS, winter conference, workshops. Bookmark the permalink.